have you noticed a spike in your grocery bill when you buy organic foods? when each item cost 50 cents to 2 bucks more, it really adds up. that could mean you end up spending double! and, if you're a mom at home who uses the market as a way to get out of the house daily, well my friend, you and i need to find a better way...one that will not put our families in financial ruin! sometimes, i make 2 and 3 and 4 trips a week to the store. when you try to cook meals using fresh ingredients, you can't load up or they'll go bad. and, things always end up in the basket that weren't on the list. i easily spend $400 a week on groceries! that's insane for two adults and one toddler. but, in my defense, the toddler eats as much as the adults. the grocery spending is officially out of control. i want to find a to buy organic thats health environmentally, and economically conscious. first, let's talk organics. i mean, if you're gonna spend the money, you should know what you're buying and why you're buying it. basically, food that is organic hasn't been grown or produced using antibioitcs, pesticides, and hormones. the enviornment and in which it is grown or produced is natural. the land is free of known toxic pesticides and fertilizers. and in most cases, the animals are able behave naturally by roaming and their living conditions are sanitary. i'll give you a rundown, but you can check out Sustainable Table for more info...in my opinion the best resource to learn about the principles of organics. antibiotics are given to livestock, poultry, and fish for two main reasons. the problem is that bacteria is becoming resistant to the antibiotics, and these antibiotics are reaching humans due to our exposure through eating and contaminated soil and water. About 80% of antibiotics pass through the animals body and reach the environment. when new bacteria come in contact, more resistance occurs. you end up with "superbugs" that cause drug resistant infections which antibiotics can't treat. children, elderly, pregnant women, and those with weakened immune system are at risk. although it begins with the animal, it ultimately ends with humans. because of it's detrimental causes, the FDA has restricts the use of a class of antibiotics that's given to livestock. pesticides are used to kill off insects and other pests. again, mostly to counteract the filthy living conditions. pesticides have been linked to infertility, birth defects, nervous system damage, and cancer. just like antibiotics, the pesticides reach us through water, soil, meat, poultry, and fish. however, we have the greatest amount of exposure through produce. hormones, both natural (male and female ) and man-made, are given to livestock to promote faster growth and given to dairy cows to greatly increase milk production. consuming meat, poultry, and dairy that have been treated with hormones has been linked to early puberty, cancer (colon and breast), birth defects, and neurological damage. we are exposed to hormones through the meat we consume, the milk we drink, and our water supply. these hormones accumulate in our bodies and disrupt our natural hormonal balance as it does in the livestock. also, cross exposure to hormones is occuring...males are getting a dose of estrogen and females are getting a dose of testosterone. although, the effects have not yet been determined, the implications are alarming. long-term exposure can cause damaging and irreversible changes to our bodies and our genetic composition. our health is being compromised by the gross greediness for monetary gain. why? because, antibiotics, pesticides, and hormones reduce the amount of time to raise and feed an animal before it's sent to the slaughter house. what it comes down to is, more poison = more profit. the flip side is that going organic as a producer costs more money. that translates into higher costs for us as consumers. as the demand the for more organic foods increase, they will become more readily available and at a price that's easier to swallow. until that happens, how do you keep your family safe from all of those antibiotics, pesticides, and hormones without going broke? how do you cut the grocery bill? going completely organic can be huge undertaking and as we mentioned, very costly. if you begin to incorporate organic foods into your life, you can choose the ones that count the most. when shopping for produce look to the Environmental Working Group's Shopper's Guide to Pesticides. cut this bad boy out and use it when you're shopping. it'll help you figure out where to spend the money and where to save the money. 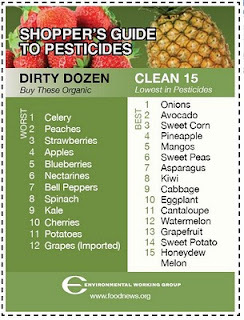 the Dirty Dozen is the list of foods that contain the most pesticides, so try to buy these organic. 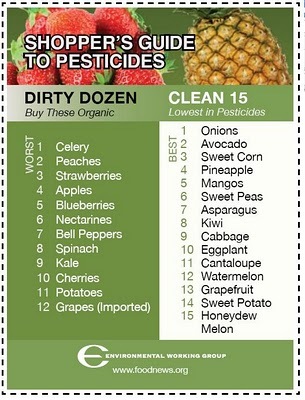 the Clean 15 are the foods with the lowest pesticides, so you can go nonorganic and save money on these. no matter what you buy, ALWAYS wash thoroughly and peel if possible. -Choose organic where it counts. Buy organic versions for those that contain the most pesticides. -Know when you can skip organic. While there are many reasons to buy organic foods, not everyone can find fresh organic produce at their supermarket, or afford the premium price tags. Certain fruits and vegetables are very low in pesticide residues so buying organic isn't as important. -Choose low-fat organic or grass-fed milk and meat. Toxins tend to accumulate in animal fat. -Wash all produce. Washing helps remove pesticides and bacteria introduced during handling and shipping. -Steam leafy greens. Cooking vastly reduces pesticides and E. coli and retains most nutrients. -Peel carrots, cucumbers, etc. This won't get at the systemic pesticides that are inside, but it will remove any that are on or in the skin. -Buy local. Regional farms serving local markets can skip the harsh chemicals that are used on crops intended for distant markets. Local Harvest makes it easy to find local food outlets in your area. -Buy frozen. Flash-freezing locks in nutrients. Use Local Harvest to find stores that sell frozen organic produce grown in your region. -Make more meals from scratch using fresh, whole, local ingredients. You'll save money and avoid not only pesticides but also unhealthy additives like sugar, salt and fat. buy and cook real portion sizes: in the past, i cooked like i was feeding a football team. 2/3 of the meal ended up in the fridge, and a day later, in the trash. if you only buy what you SHOULD eat in one meal, you'll save money. of course, you can bend this rule if you actually eat your leftovers. make meat more of a side dish: the trend in saving on organic meat these days is filling your plate with veggies and salad while serving a smaller portion of meat. buy the whole cow (or elk or venison or pig): well, a whole cow can run you about $1200. but, if you split between a few families, you could save lots of money. for example, my family eats about 4 pounds of beef per week with an average cost of $50, easily. that's roughly 208 pounds of beef for about $2600 per year. if we go three-ways on a cow, each family would spend $400 for about 130 pounds of beef...for the year! we're talkin' a $2200 savings! i don't know about you, but that's a lot of money to me. of course, prices vary. if you want to put a little extra effort for a big time pay-off, you could join a CSA...community supported agriculture. basically, you either pay a fee at the beginning of growing season or weekly, and when the local crop is harvested you get a weekly assortment of fruits and vegetables. Eating organic food is a great step towards a healthy lifestyle. Unfortunately, many organic fruits and vegetables are a bit more costly. To combat the increased cost, and to ensure that the food you are eating is 100% organic, you may want to start your own organic garden. thanks for the advice, amy! i'm looking into taking a gardening class at my local CSA.